Two additional denominations of German states stamps for the Free City of Hamburg were added during the early part of 1864. The 1 ¼ Schilling denomination was issued in February 1864, and the 2 ½ Schilling denomination was issued in April 1864. Both new stamp denominations are lithographed on medium thick paper with the serpentine wave watermark, and they are imperforate. The gum on mint stamps ranges from brownish yellow to whitish. There were EIGHT printings of the imperforate 1 ¼ Schilling denomination, with the stamps being produced in distinctly different colors. They are ALL shown in the images above. This is just incredible, considering these imperforate stamps were only in use for about 6 months, when they were replaced by new, perforated stamps in August 1864! (Mi. #8a, Sc. #9e) - Light Violet Brown. (Mi. #8b, Sc. #9d) - Deep Gray Green. (Mi. #8c, Sc. #9) - Deep Gray. (Mi. #8d, Sc. #9c) - Medium to Bright Blue Green. (Mi. #8e, Sc. N/L (1)) - Dull Violet. There was only one printing of the imperforate 2 ½ Schilling denomination. The shades range from Dark Opal Green to Dark Bluish Green. An example is shown in the image above (Mi. #9, Sc. #12). The spacing between the 1864 imperforate stamps of Hamburg was more evenly distributed than that of the 1859 imperforate stamps. There are vertical AND horizontal dividing lines between the stamps within the sheet. These attributes can be seen in the image shown above. The spacing between the positions on the printing plates was 2.6 mm vertically and 2.8 mm horizontally. 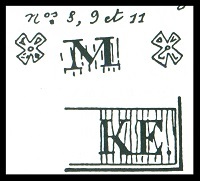 The Michel catalog recommends collecting these imperforate stamps with at least one of the horizontal and one of the vertical margins being equal to or exceeding 1.5 mm, or showing portions of one vertical separator line and one horizontal separator line. THIS IS VERY IMPORTANT! These same plates were used to print the same line perforated 13 ½ stamp denominations of 1864 - 1867. Many people, over the years, have trimmed the perforations off these stamps and have represented them as being the 1864 imperforate issues. These two imperforate stamps were in use for a very short period of time, and examples of them are worth FAR MORE than the perforated stamps. 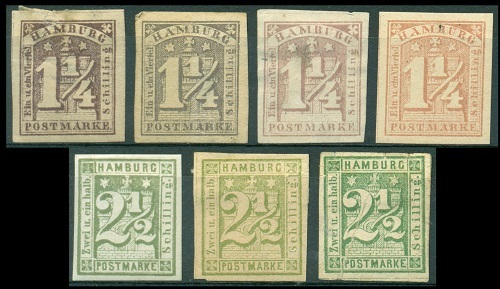 Thus, any of these German states stamps for the Free City of Hamburg, not exhibiting the conditions noted above, are very likely the 1864 - 1867 perforated stamps that have been trimmed to resemble the two 1864 imperforate stamps. (Mi. #8 P 1) - Black on White Card Paper, without Watermark. (Mi. #8 P 2) - Brown or Red on White Paper, with Watermark. (Mi. #8 P 3) - Brown on Yellowish Paper or Purple Violet on Grayish Paper, without Watermark. (Mi. #9 P 1) - Black on White Card Paper, without Watermark. (Mi. #9 P 2) - Opal Green on Yellowish or Lilac Paper, without Watermark. There ARE private reprints of #8 P 1 and of #9 P 1. PLATING is REQUIRED for authentication. Generally speaking, if one of the two imperforate stamps, issued in early 1864, shows a watermark, and it has ample margins, it is probably authentic. Though this presumption is widely accepted, it can, in some cases, be a dangerous practice. To make things a lot more technical here, each of the two 1864 imperforate stamps has plate characteristics that are NOT PRESENT on the forgeries and reprints. Some people refer to these as secret marks, but this is a misnomer, as they were not intentionally placed there by the plate engravers. 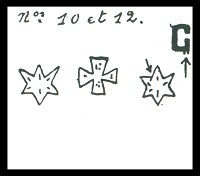 Drawings of the plating characteristics of the 1 ¼ Schilling and the 2 ½ Schilling denominations are shown in the graphic images below. These attributes are also applicable to the perforated 13 ½ stamps of these same denominations issued between late 1864 and 1867. Many private reprints exist of these two imperforate stamp denominations, most of them having been manufactured by the infamous Hamburg stamp dealer / wholesaler, Julius Goldner. The vast majority of the private reprints are printed on papers of varying thickness and colors, and they are unwatermarked. The rare watermarked reprints do not have the same plating characteristics (secret marks) that are found on the original stamps. Overall, the reprints are characterized by poor impressions that do not exhibit the clear detail of the original printings, and their colors are not exactly the same as those of the originals. In some cases, however, as can be seen in the image above, some of the shades can be deceptively close to those of the originally issued printings. Thus, for authentication purposes, these two imperforate German states stamp issues MUST BE PLATED.